WASHINGTON -- Thousands of protesters marched across the country Saturday to call attention to the deaths of unarmed black men at the hands of police and urge lawmakers to take action. In New York City, tens of thousands of people marched up Fifth Avenue in Midtown after gathering at Washington Square Park in Greenwich Village, CBS New York reported. 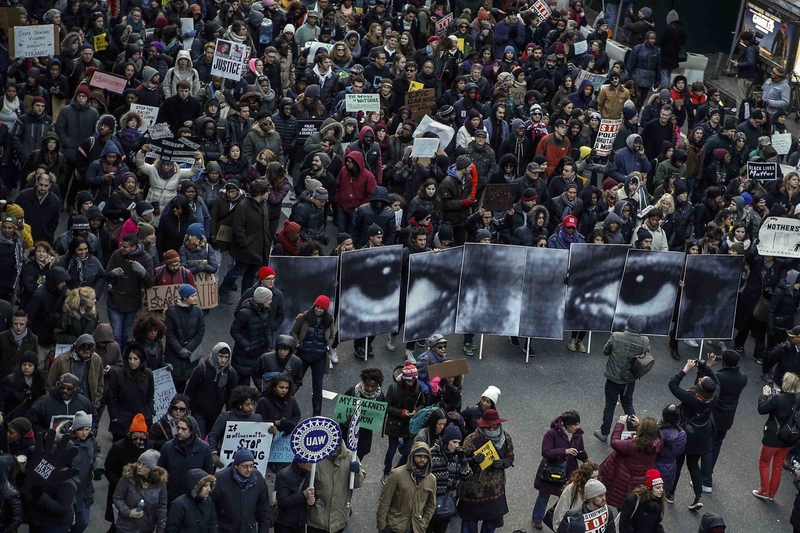 Organizers of Millions March NYC are demanding justice for 18-year-old Michael Brown in Ferguson, Missouri, Staten Island father Eric Garner, who died in July after an NYPD officer put him in a chokehold, and Akai Gurley, the unarmed man fatally shot by police in a stairwell in East New York last month. They also want special prosecutors appointed to hand cases of alleged police brutality. The noisy march through the heart of Manhattan swelled to at least 25,000 people, police said. As evening fell, thousands of people rallied outside NYPD headquarters as officers stood guard at the entrance to One Police Plaza. "There is a systematic murder of people of color in this country and it's institutionalized racism. The people are here to convince the people in power to legislate against this," a man at the rally, who didn't want to give his name, told CBS radio station WINS-AM in New York. Although the protests remained mainly peaceful, a press conference late Saturday night, Chief of Department James P. O'Neill said two officers were assaulted on the Brooklyn Bridge. CBS New York reported two police saw a man attempting to throw a garbage can onto the roadway and attempted to make an arrest. The officers were then reportedly assaulted, kicked in the face and head by numerous other protesters, according to authorities. During that incident, O'Neill said police found a bag containing what appeared to be newly-purchased hammers and a black mask. "This is where we have to step in and make arrests. We cannot have our officers assaulted," O'Neill said. One person was arrested for disorderly conduct. The officers' injuries were not life-threatening, authorities said. O'Neill also said there were numerous reports of fireworks being set off on Madison Avenue and the Brooklyn Bridge. Authorities also say a rear window was smashed in an incident on Madison Avenue. "I don't know what's the next step. That's why I'm taking this one," a protester named Shannon told CBS New York earlier Saturday. "I know that my voice being heard is one step that I can take." "America is supposed to value all of its citizens. We're supposed to have justice for all," Jamelia, a Westchester resident, said. "But clearly that's not what's going on. So we have to fight for what's right." Rich Alexandro, 47, carried a handmade sign with dozens of names of people who died in encounters with police who were never charged. "It just seems like the cops are Teflon," Alexandro said. "There's no justice." Family members of people killed in New York City police encounters going back decades also were among the demonstrators. They included Iris Baez, whose son Anthony Baez died after he apparently was placed in a chokehold in 1994. Donna Carter, 54, marched with her boyfriend, whose teenage son was shot and killed by police in the 1990s while carrying a toy gun. "It's good to see people of all colors here to say enough is enough," said Carter, who is black. "I'm a parent and every child that's killed feels like my child." In Washington, D.C., a crowd gathered in Freedom Plaza before marching down Pennsylvania Avenue and past the White House, carrying signs reading "Black Lives Matter" and "Who do you protect? Who do you serve?" "Let's keep it strong, long and meaningful," Esaw Garner, Eric Garner's widow, told the crowd. "I appreciate everyone that's out there marching for my husband because had it not been for the tape, for the people, for Reverend Al (Sharpton) putting it out there he would've just been another black man killed, and it would've been over," she said during an interview on "CBS This Morning" last week. "This way, his name will be remembered." Garner's mother, Gwen Carr, called Saturday's demonstration a "history-making moment." "It's just so overwhelming to see all who have come to stand with us today," she said. "I mean, look at the masses. Black, white, all races, all religion.... We need to stand like this at all times." "What a sea of people," said Lesley McSpadden, the mother of Michael Brown, told the protesters. "If they don't see this and make a change, then I don't know what we got to do. Thank you for having my back." Also speaking were Sharpton, the civil rights leader, family members of Tamir Rice, a 12-year-old shot and killed by a Cleveland, Ohio, police officer in November as he played with a pellet gun in a park. "Members of Congress, beware we're serious...," Sharpton said. "When you get a ring-ding on Christmas, it might not be Santa. It may be Rev. Al coming to your house." Several speakers asked the crowd to chant, "I can't breathe." Garner, 43, had gasped those words before his death while being arrested for allegedly selling loose, untaxed cigarettes. Some protesters also wore those words on shirts. Other speakers called for a chant of "Hands up, don't shoot." The rally was interrupted briefly by more than a dozen protesters who took the stage with a bullhorn. They announced that they were from St. Louis and Ferguson and demanded to speak. Large numbers of protesters on the ground supported the group, some chanting, "Let them speak." Ultimately, rally organizers allowed Johnetta Elzie of St. Louis to address the crowd. "This movement was started by the young people," she said. The group, mostly in their 20s, left the stage after she spoke. Organizers called the interruption unnecessarily divisive. But some in the Missouri group said they were disappointed and found the rally staid and ineffective. "I thought there was going to be actions, not a show. This is a show," Elzie said. Protests -- some violent -- have occurred around the nation since grand juries last month declined to indict the officers involved in the deaths of Brown and Garner. Before the crowd started marching, Sharpton directed, "Don't let no provocateurs get you out of line. ... We are not here to play big shot. We are here to win." Then, blocks of tightly packed people moved through the city. D.C. Police Chief Cathy Lanier mingled with the crowd and said she wanted to show solidarity with the marchers. "This is one of the most well-organized events I've seen," Lanier said. Politicians and others have talked about the need for better police training, body cameras and changes in the grand jury process to restore faith in the legal system. Terry Baisden, 52, of Baltimore said she is "hopeful change is coming" and that the movement is not part of a fleeting flash of anger. She said she hasn't protested before but felt compelled to because "changes in action, changes in belief, happen in numbers." Murry Edwards said he made the trip to Washington from St. Louis because he wants to make sure the momentum from the movement in Ferguson reaches a national stage. "This is the national march," Edwards said. "We have to get behind the national movement." Sheryce Holloway, a recent graduate from Virginia Commonwealth University in Richmond, attended a smaller gathering outside Robert F. Kennedy Stadium in Washington ahead of the main rally. She said she also has been participating in protests at her alma mater. Holloway said the goal of the protests is "ending blue-on-black crime. Black lives do matter." Saturday's march in Washington was organized in part by the National Action Network, the Urban League and the NAACP. Groups including Ferguson Action were conducting similar "Day of Resistance" movements all around the country. In Boston, hundreds of demonstrators marched from the Massachusetts Statehouse chanting "Black Lives Matter," according to CBS Boston. Organizer Brandy Artez told CBS Boston that protesters want to see body cameras worn on all police officers, a topic that has brought mixed reaction around the state and country. Near the Nashua Street Jail, demonstrators staged a 20-minute "die-in" as prisoners watched from the windows. They also marched to TD Garden, where the Boston Bruins were playing. Police said 23 protesters were arrested after scuffling with officers blocking an on-ramp to Interstate 93. The 15 men and eight women faced disorderly conduct charges. Officers were dismissed around 5 p.m. as the crowds broke up. Rallies caused gridlock across San Francisco, CBS station KPIX reported. The Embarcadero was shut down temporarily as protesters marched to City Hall. In the East Bay, demonstrators made their way from Berkeley to Oakland, where several hundred protesters gathered on the steps of the Alameda County Courthouse. Saturday morning, three cardboard cutouts of black men were found hanging by nooses on the campus of the University of California, Berkeley, according to KPIX. "These images are very upsetting," said campus spokeswoman Claire Holmes, who said the school and police were trying to determine who was responsible. The life-sized photographs included names of actual past lynching victims and the dates of their death. At least one effigy had "I Can't Breathe" printed on the front. Two were removed by police and a student took down the third. "Clearly those are words that are being used as part of the protest today against police violence," Holmes told KPIX. "But this could also potentially have been racially motivated." Organizers of the Berkeley protest said they were also unaware of who put up the effigies. "We hope that it's someone who wanted to bring attention to the issue," said Spencer Pritchard, 21, a UC Berkeley student and an organizer of the Berkeley protest, which was peaceful and attended by about 200 people. As of Saturday evening, the Bay Area demonstrations remained peaceful with no reports of violence or arrests. Earlier in the week, several protests in Berkeley and Oakland turned violent after dark. On Wednesday, a plainclothes California Highway Patrol officer pulled his gun on demonstrators in Oakland after another officer was injured.